Generally the Boltgun Metal areas were utilitarian in nature, ie. turbines, parts of landing gear and turrets. Stuff that moves around a lot or may be fixed or replaced a lot by servitors. Next up was doing detail work on the wings. 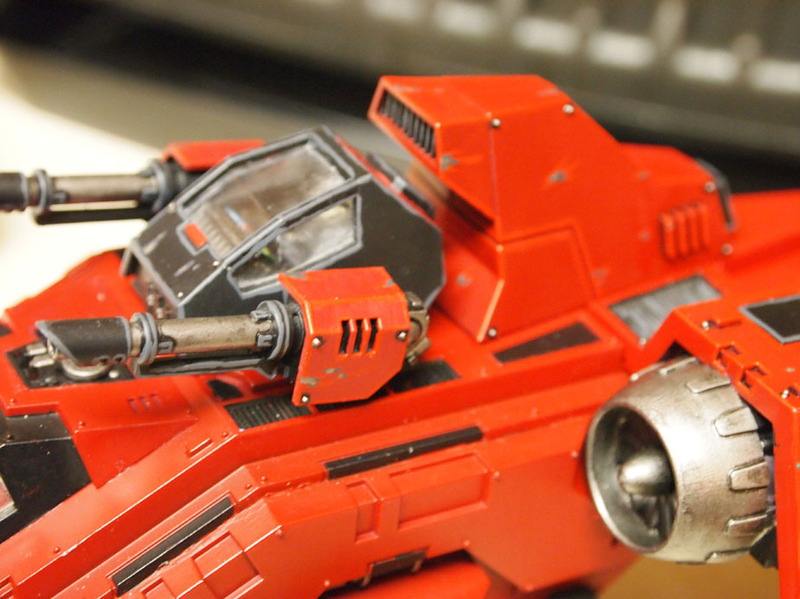 For Dragon Red, GW’s Blood Red makes a great highlight color. So after filling all the groove lines with Black Ink (Badab Black? ), I did highlight line work along all the sharp edges and lines with Blood Red. Then as a final highlight you can also use Blazing Orange on the corner edges of the highlighted areas. 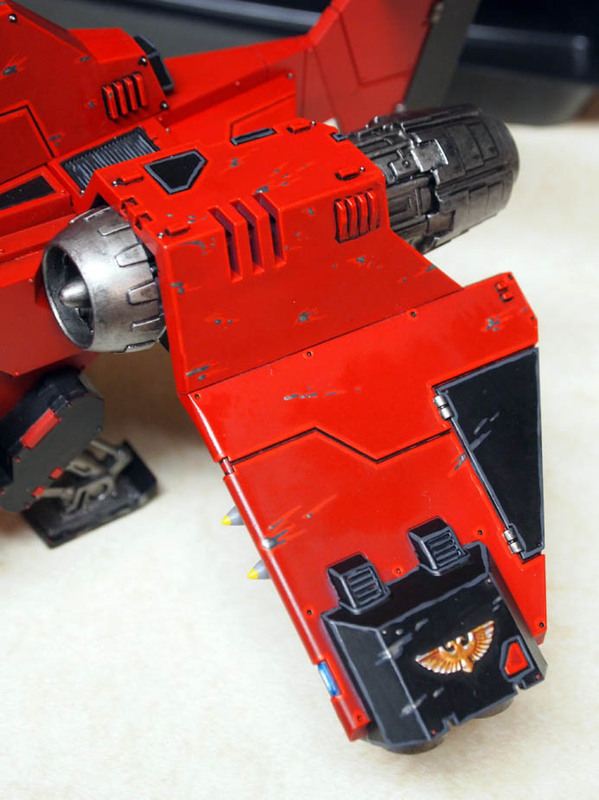 I didn’t use Blazing Orange on my Stormraven, but I have begun using it on my latest Blood Angels troops and it looks great. 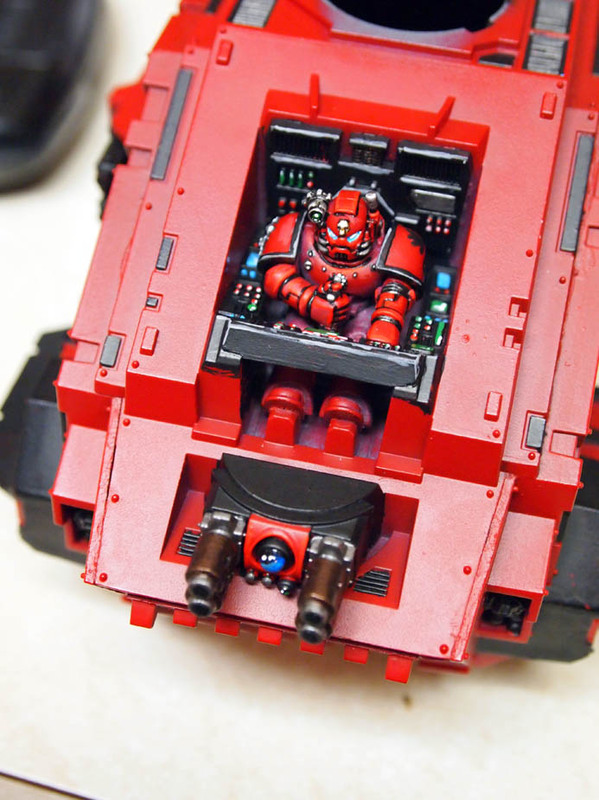 I’ll definitely be using it from now on with my Blood Angels army. For the areas painted Chaos Black, I used a 1:1 mix of Chaos Black and Codex Grey for the highlight lines. For the jet engines and turbine fans on the wing tips, I did a base coat of Boltgun Metal and then did a heavy wash of the Badab Black wash . After that I drybrushed the engines and turbines with Boltgun Metal to remove the “ink spots” and still leave the black ink in the recessed areas. 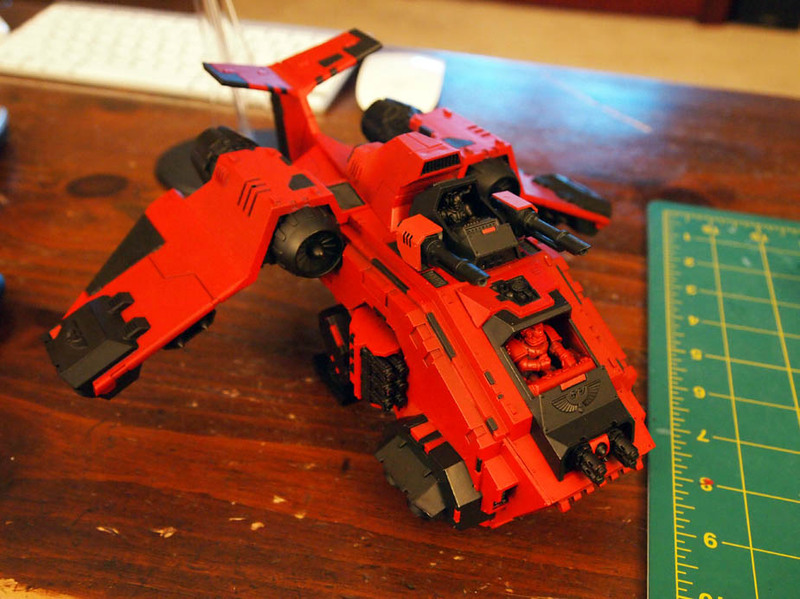 After doing the line work I added paint chip battle damage. I tried to make it look like these hits happened while the ship was at a high velocity so I gave them a directional streaky brush stroke. First I laid down whatever the highlight color of that section was, Blood Red or the 1:1 mix. After the shape is established I used the 1:1 mix of Chaos Black and Codex Grey inside that shape making sure to leave the original highlight color’s edges visible. Lastly, I put Boltgun Metal inside to show any exposed metal. 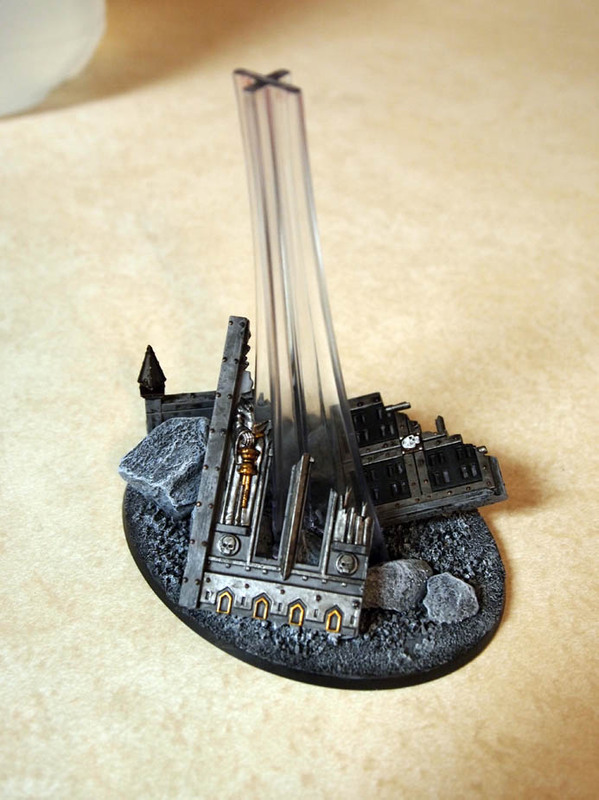 Next I’ll show how I made the base to my Stormraven. For my Blood Angels army, I want them to have urban themed bases. In fact I wanted them to be a post apocalyptic urban rubble look just like their home planet, Baal. Eventually if I ever get enough space (and money), I want to make an urban themed Realm of Battle board for my Blood Angels (I also want to make a desert themed one for my Tau). 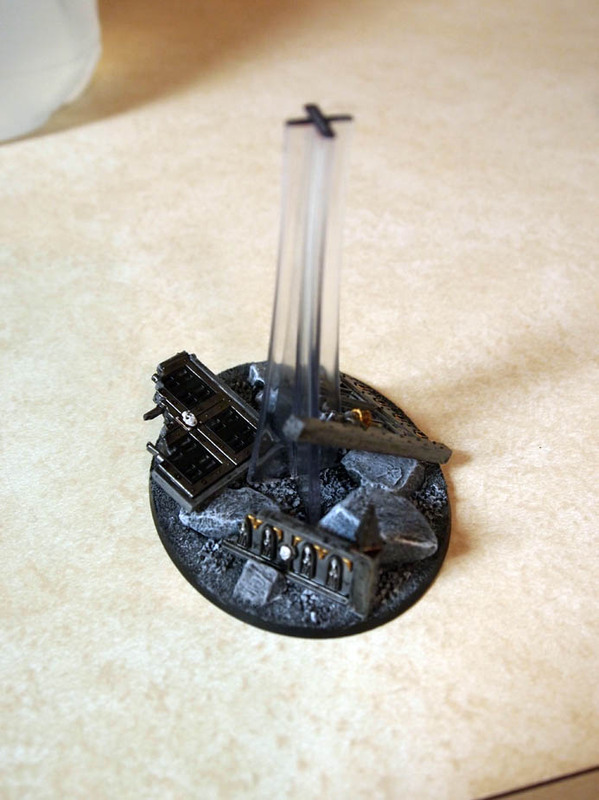 But for now, I wanted to do a real nice rubble laden base for my Stormraven. Thanks for my friend Kung Fu Dave, I was able to get some scrap terrain bits. I also had a bunch of actual rocks that I was gonna use as bigger boulders. I painted all the terrain part first before gluing anything to the base. I made the terrain masonry a drab Codex grey and then washed it with a 1:1 wash of Black ink/wash and water. I then painted the metal relief portions with Boltgun Metal and then the same 1:1 wash. After that I painted the details with Gold and Mithril Silver. After this I glued down the larger rocks first, then I glued down patches of GW’s gravel base mix and finally filled in the rest with GW’s sand base mix. I primed all the rocks/gravel/sand with black and then drybrushed Codex Grey onto everything. For the larger rocks I also did a final light drybrush of white along the edges only. Then I finally glued on all of the terrain rubble portions trying to make them not poke out too far from the main base. For the next installment, we’ll have final picts, how to paint the detailed icons and a tutorial on how to make your decals blend in with the rest of your painted model. This entry was posted on April 26, 2012, 9:59 am and is filed under Tutorials. You can follow any responses to this entry through RSS 2.0. Both comments and pings are currently closed.